Benson Lake Tr > Scott Mt Tr > Hand Lake Tr | 10 mi. | 1300′ ele. gain | 5:30 hr. My brother and his girlfriend were visiting from the east coast and I wanted to show off the beautiful hiking in our state. I’d taken my brother on many adventures out here: Mt. St. Helens, the coast, the Gorge, etc. and wanted to find something new. Aaron and I decided to drive them out to the Old McKenzie Pass Highway to see the big lava flow and to explore some unique volcanic terrain. 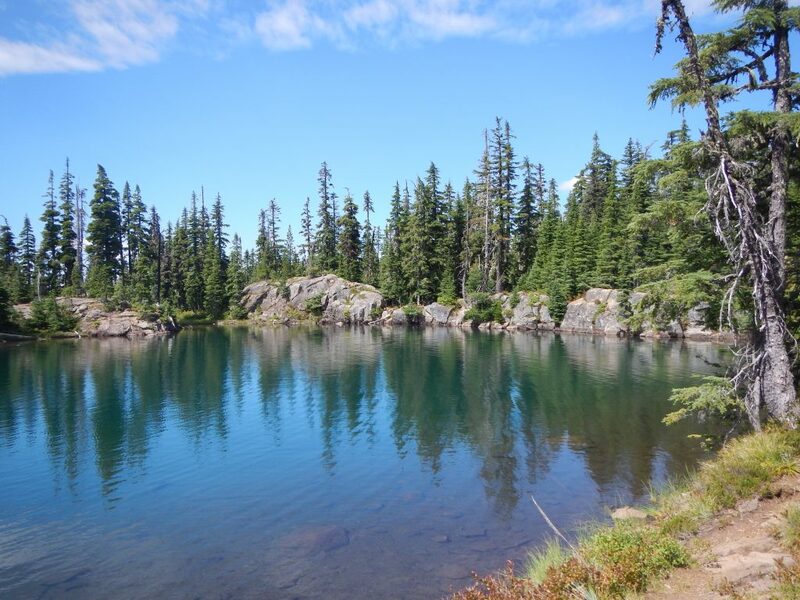 We began at the Benson Lake trailhead at a leisurely 11:30 am. The lot was packed. We set out through the dusty forest on our way to the lake. It was so busy at Benson we decided to just blast ahead to Tenas Lakes. There were a few choice viewpoints here to ooh and aah at the clear, blue water. But we had some ground to cover so we didn’t dally too long. We took our first real stop at the top of Scott Mtn. Perfect, puffy skies stood among a backdrop of blue skies. The Three Sisters were clearly visible, as was Mt. Washington and all the other volcanic highpoints in Central Oregon. It was a postcard day to be out hiking. We stopped to munch on huckleberries on our way back down the mountain. A west coast treat! The trail to Hand Lake traversed through an old burn. 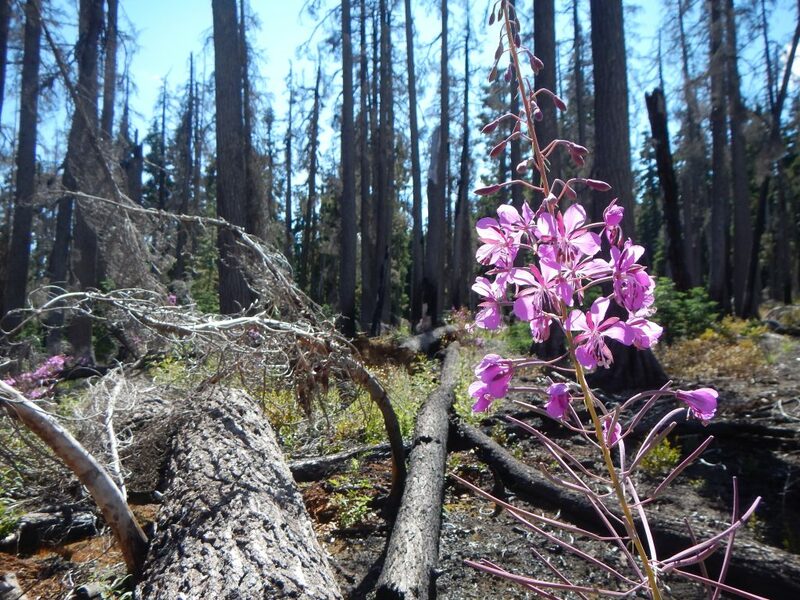 Fireweed bloomed in large numbers along the path. At the T-junction we turned right and kept our eyes peeled for the old wagon road mentioned in Sullivan’s book. 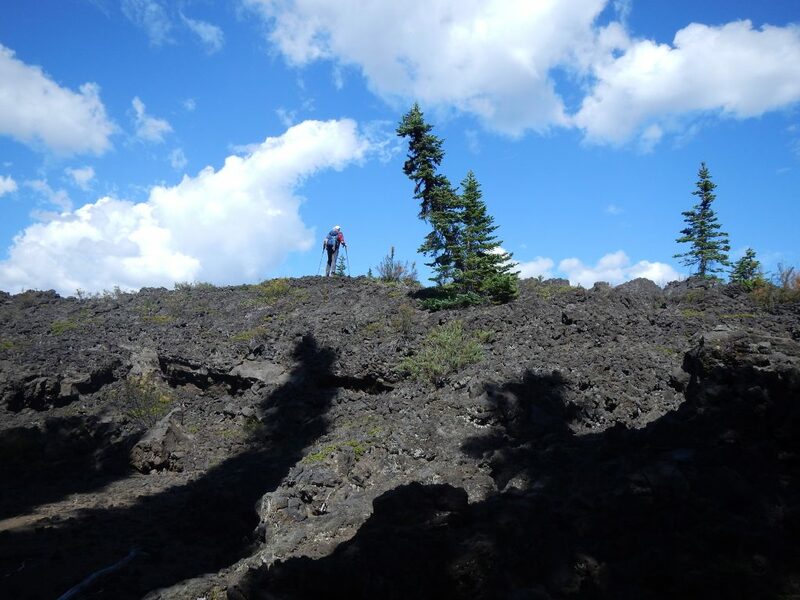 It was subtle but not too hard to find, and provided a way to get across the jumbled rocks of the lava field. 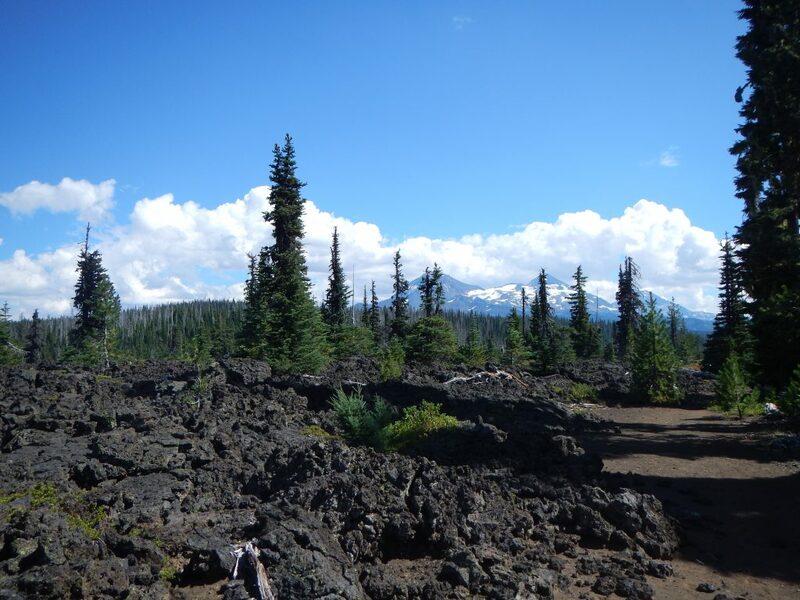 On the other side we simply followed the edge of the lava flow to reach Hand Lake. The lake’s blue water sparkled in the sun. It was just what Aaron needed. He took a dip in the water and we continued contouring around the lake’s edge. At the Hand Lake Shelter we found our return trail and finished the loop back to the car. 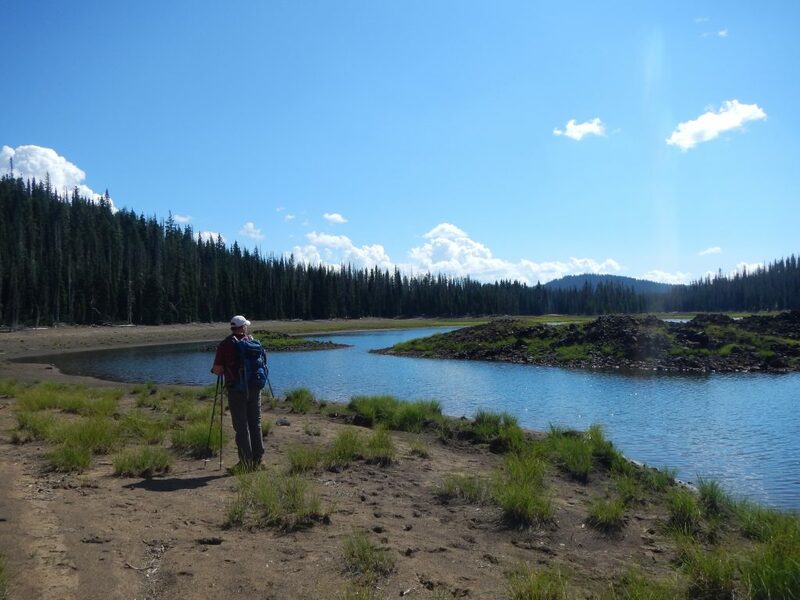 This loop offered a great cross-section of Central Oregon’s wonders: mountains, lava, lakes, views, meadows, wildflowers and berries. We all enjoyed the scenery, physical activity and companionship on the trail today. 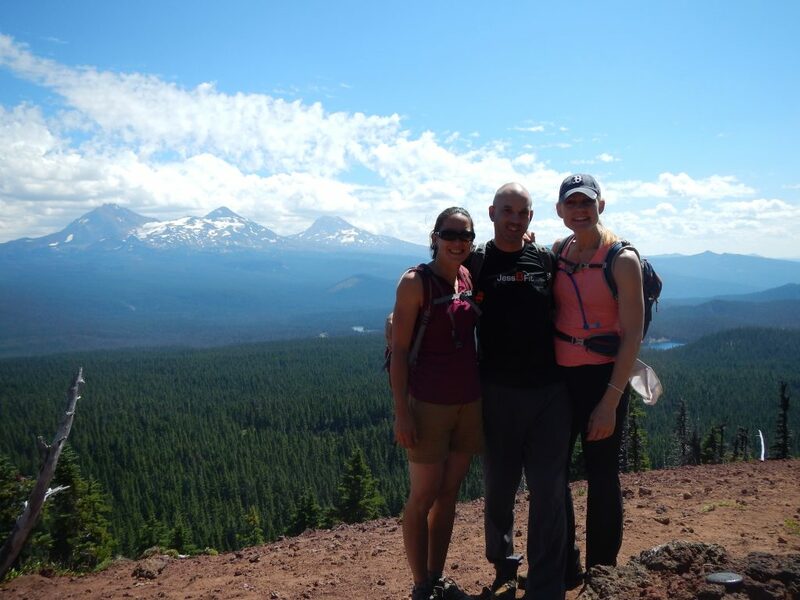 This entry was posted in Hiking, Oregon and tagged hike366 on August 25, 2014 by Jess B.